Central University of Jammu CUJ Jobs Recruitment 2019 various Teaching posts. In latest CU Jammu rolling advertisement application are invited for Professor, Associate, Assistant professor posts. 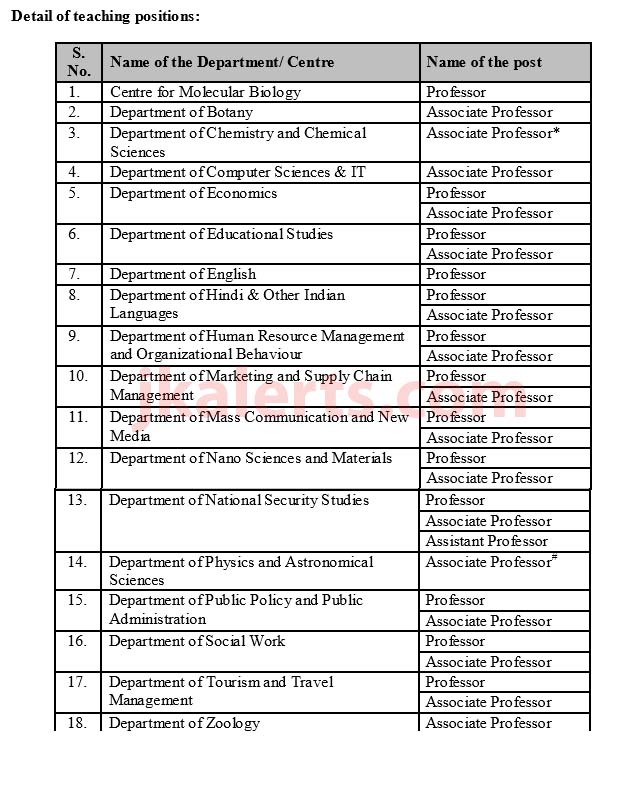 Central University Jammu latest job notification for various Professor, Associate, Assistant professor (Teaching positions). Applications are invited from Indian nationals including Overseas Citizens of India (OCIs) to fill up the following posts on direct recruitment basis. Eligible/suitable candidates may submit their application in the prescribed format. Candidates working in Govt./Semi Govt./Public Sector Undertaking/Autonomous Institutions/ etc. will submit their applications through proper channel. Only shortlisted candidates will be called for interview. Minimum eligibility and qualifications for each post is governed by UGC Regulation, 2018. The qualification required for teaching posts will be as per “UGC (Minimum Qualifications for Appointment of Teachers and other Academic Staff in Universities and Colleges and Measures for the Maintenance of Standards in Higher Education) Regulations, 2018. J&K New Government Medical College Jobs Recruitment. For teaching positions in Department of Educational studies, NCTE Regulations of 2014 shall be followed. This is a Rolling Advertisement. Applications received after 01.03.2019 will be considered in the next phase of scrutiny and Interview.